His Holiness Patriarch Kirill of Moscow and All Russia sent messages to the Primates of the Local Orthodox Churches; Pope Francis; Archbishop of Canterbury Justin Welby, head of the Anglican Communion; Rev. Dr. Olav Fykse Tveit, General Secretary of the World Council of Churches; Mr. António Guterres, United Nations Secretary-General; Mr. Thomas Greminger, Secretary General of the Organization for Security and Co-operation in Europe; as well as to H.E. Mr. Emmanuel Macron, President of France; and H.E. Mrs. Angela Merkel, Chancellor of Germany as heads of the Normandy Four states. His Holiness Patriarch Kirill draw their attention to the large-scale violations of the rights and freedom of hierarchs, clergy and laity of the Ukrainian Orthodox Church. At the level of the Government and local authorities attempts are being made to deprive the Ukrainian Orthodox Church of its legal rights to use the Kiev Caves and Pochaev Lavras – major holy sites of the Orthodox Ukraine. “Thus, on November 23, 2018, the Ministry of Justice of Ukraine revoked the decision on the state registration of the right of the monastic community to use the complex of buildings of the Holy Dormition Pochaev Lavra. And on November 28, the Cabinet of Ministers of Ukraine revoked its instruction of July 17, 2003, On the Exclusion of the Holy Dormition Pochaev Lavra from the Kremenets-Pochaev State Historical-Architectural Reserve. The reserve representatives do not conceal that in future the monastery can be given for use to another religious organization. On December 5, the Kremenets-Pochaev Reserve conducted an inspection of items of church value in the Holy Dormition Pochaev Lavra,” the letter says. His Holiness mentions that on November 28, for the first time in thirty years, a commission of the Ministry of Culture of Ukraine conducted an inspection of cultural property in the territory of the Holy Dormition Kiev Caves Lavra. On November 30, a search was conducted in the territory of a subsidiary farm of the Kiev Caves Lavra in the village of Voronkov of the Borispol district, Kiev region. During the search, a number of irregularities in judicial proceedings occurred. As it is emphasized in the messages, attempts are being made to hold bishops and clerics criminally liable on baseless charges of “high treason” and “incitement to religious hatred.” In a number of regions in Ukraine massive searches are being carried out on the premises of diocesan administrations, churches and places of clergymen’s residence. For instance, on December 1, this year, twenty clergymen from the dioceses of Rovno and Sarny of the Ukrainian Orthodox Church (Rovno region) were summoned at the same time for questioning by the Security Service of Ukraine. On December 3, searches were conducted in cathedrals, diocesan administrations, churches and even private houses of the Ukrainian Orthodox Church’s clergymen in the cities of Zhytomir, Ovruch and Korosten. On December 5, twelve clergymen from the dioceses of Rovno and Sarny of the Ukrainian Orthodox Church were interrogated. As is stated in the documents, an investigation is being carried out within the framework of criminal proceedings under Article 111 (“high treason”) and Article 161 (“incitement to religious hatred”) of the Criminal Code of Ukraine. His Holiness notes that “the high-ranking Ukrainian officials are not averse to making allegations in public against the Ukrainian Orthodox Church, thus inciting inter-confessional hatred.” For instance, on November 30, 2018, Mr. Zoryan Shkiryak, adviser to the Ukrainian Minister of Interior, said in public that Metropolitan Pavel of Vyshgorod and Chernobyl, abbot of the Holy Dormition Kiev Caves Lavra, “is a vampire who hates Ukraine, the Ukrainians and everything Ukrainian.” Mr. Andriy Parubiy, chairman of the Verkhovna Rada, also took the liberty of making public insulting and slanderous allegations against the Ukrainian Orthodox Church. In particular, he said in public that clergymen of the Ukrainian Orthodox Church were instrumental in perpetration of murders of the Ukrainian citizens. “We do not know what steps the authorities of Ukraine will take next, what actions they can dare to undertake to achieve their goal in a time left before the presidential elections. 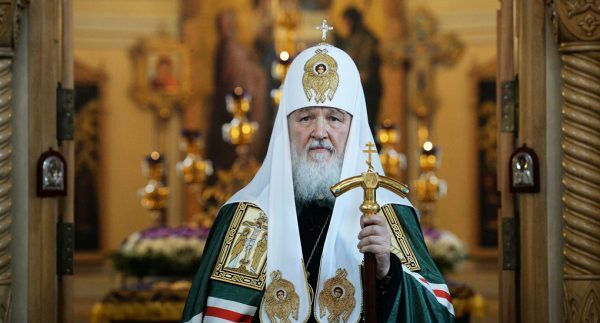 Yet, the numerous facts of discrimination to which the Ukrainian Church has already been subjected make us fear even more serious infringement on the rights and freedoms of the Orthodox Christians, their greater sufferings for remaining faithful to the canonical Orthodoxy,” His Holiness Patriarch Kirill writes in his letters. “In our plain view the governmental authorities of Ukraine are blatantly interfering in church life, the fundamental human rights are being violated, and an obvious attempt is being made to use the Church for political benefits and in the election campaign,” the letters read. The Primate of the Russian Church called upon the religious leaders, senior statesmen and heads of international organizations to make every effort to protect the episcopate, clergy and laity of the Ukrainian Orthodox Church from discrimination and pressure exerted by the Ukrainian authorities and to defend the freedom of conscience and religion secured by the international law.